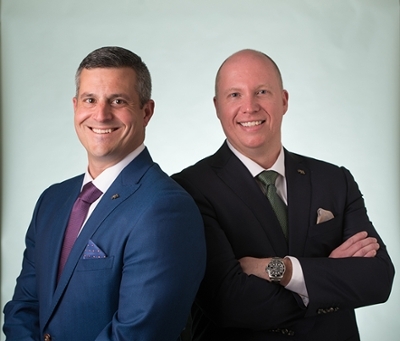 Southern Illinois University Edwardsville Graduate School alumni Kyle Griffith and Frank Grasso are making their mark in the local healthcare industry, achieving pioneering success in dual roles as nurse anesthetists and businessmen. Cape Girardeau native Griffith set the business plan in motion for Edwardsville-based G & G Anesthesia, LLC, while he was pursuing his master’s of nursing/nurse anesthesia at SIUE. At that time, the G & G stood for him and his fiancé, Erin. The classmates earned their advanced degrees in 2005 and got married the day after graduation. A few years later, Grasso came through the SIUE School of Nursing (SON), earning a bachelor’s of nursing in 2006 and master’s of nurse anesthesia in 2010. Fittingly, the Pinckneyville native had the same superior clinical skills and zest for business, not to mention a ‘G’ last name, for Griffith to invite him to move the company under joint ownership in 2014. As Certified Registered Nurse Anesthetists (CRNAs), Griffith and Grasso’s company is breaking the mold of what’s been the traditional approach to anesthesia care. G & G Anesthesia’s model is CRNA focused, with the company now employing three anesthesiologists and 15 full-time CRNAs. The entrepreneurs have secured contracts with HSHS St. Joseph’s Hospital in Highland, OSF St. Anthony’s Health Center in Alton and Gateway Regional Medical Center in Granite City. “Our practice is built off of mutual respect,” Griffith said. “We have hired incredible physicians who serve as medical directors, but we allow our CRNAs to be completely independent and work on all types of cases, including obstetrics. Griffith and Grasso stress the productive powerful combination of exceptional clinical skills and exemplary interpersonal skills. The two are imperative attributes of their employees, the majority of whom are SIUE alumni. G & G Anesthesia’s clinical sites serve as training opportunities for current students. The co-owners know firsthand how impactful such clinical opportunities are for students, and are constantly keeping tabs on those who may have the abilities to be a future asset to their company. “Relationships with alumni like this serve a key role in both the quality of our clinical education and the appeal of our program to the prospective student,” said Andrew Griffin, PhD, CRNA, APN, assistant dean of graduate programs and director of the nurse anesthesia program in the SIUE SON. “The achievements of Kyle and Frank are also successes for our University and program. I am excited about expanding on future opportunities with G & G.
SIUE’s nurse anesthesia program is now a Doctor of Nursing Practice (DNP) program. Griffith and Grasso are in early discussions with the University to create a corporate agreement that would allow their employees the possibility of enrolling in the post-master’s option for that program with support from G & G Anesthesia. If realized, it could be one of the first of its kind for any anesthesia group in the country. The innovative company’s explosive growth is just the start of what the SIUE alumni aspire to achieve. Plans are already in motion for their next business venture, which will expand their model into pain management. Photo: (L-R) Frank Grasso, CRNA, and Kyle Griffith, CRNA, SIUE alumni and co-owners of G & G Anesthesia, LLC.